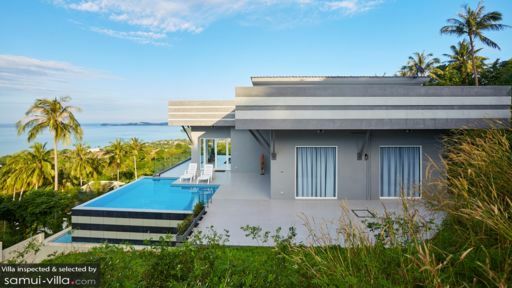 Offering spectacular views of Koh Samui’s many beautiful spots like Bophut and Maenam Bay, Villa Natasha is a contemporary, 3-bedroom private holiday home situated on an elevated level from the neighbouring areas thus providing guests with unparalleled scenes from all directions. The private villa affords much-needed exclusivity and security to the guests, given its location. An infinity-edge pool is the crowning glory of Villa Natasha, overlooking vast stretches of vegetation and sparkling-blue waters. There are three bedrooms at Villa Natasha, each of them uniquely designed and well-furnished. While one bedroom opens out to the private garden, rich with tropical foliage, the second bedroom opens out to a terrace. The third bedroom is located on the mezzanine floor of the private media room that is furnished with a flat-screen TV. Each bedroom is furnished with double beds and is comfortable. There is one en-suite bathroom and a guest bathroom for the comforts of the guests. The most striking feature of Villa Natasha is its infinity-edge pool that overlooks dense tropical forests and towering palm trees and then opens out to the sandy beaches and sea-views. The breathtaking space is perfect for lazing around and spending your days floating around in the water, as you relish the remarkable serenity and beauty of Koh Samui. 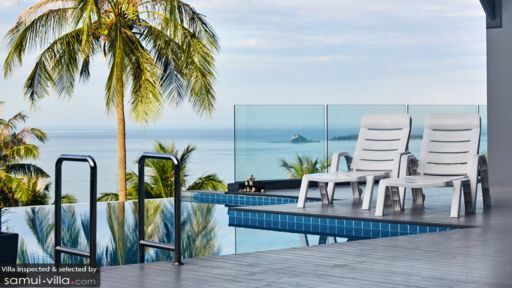 The pool deck houses several chairs and sun loungers, where you can relax and enjoy the views taking your own precious time, because when on vacation there is no concept of time. The clear-blue skies compliment the natural greenery, enhancing the tropical experience. The gorgeous and expansive living area is made up of glass walls for an unobstructed view of the surrounding beauty of the villa. With a spacious, and minimally furnished area the living area is a private and warm room, wherein guests can comfortably spend hours, lounging on the large comfy sofa, watching TV or the view out their window. The modern aesthetics are enhanced by traditional artefacts and artwork lining the walls. Some indoor plants ensure the room remains fresh and well-aired at all times. Along with the living space, there is a fully-furnished dining and kitchen area which boasts of a fully-equipped kitchen fitted with modern appliance and amenities along with island with barstools for additional sitting for the guests. There is a dining table in the middle of the room, which can easily seat all the guests of the villa. A smaller room is a study with a desk and office chair for those who wish to get some work done in their peaceful surroundings as there is no one and/or nothing to disturb your peace. As per the demands of the guests, the staff can be present to cater to your needs or if you wish to have a private experience then the staff can be on standby for you. There is maintenance and housekeeping twice a week for the convenience of the guests. 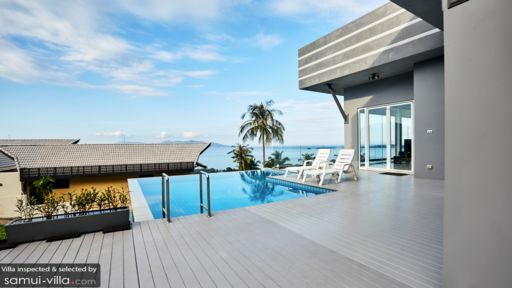 Villa Natasha is ideal for those looking to spend a bulk of their time on the beaches of Koh Samui. Chaweng beach is in the vicinity and the villa overlooks Bophut and Maenam Bay, so you can make your way to the sandy shores and even enjoy some water activities while you are it!